There's red velvet, and then there's Red Velvet! 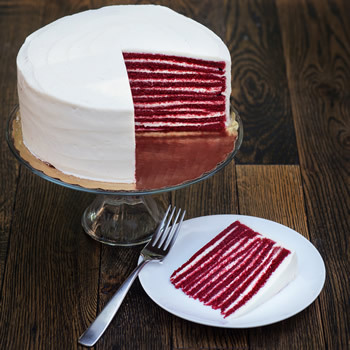 Our Red Velvet Smith Island Cake is in a league of its own. Made from scratch and featuring layers of moist Red Velvet cake and our signature cream cheese frosting. The cake is approx. 9" in diameter, 3.5" tall, and yields 14-16 slices. Like all SIBC products, it is shipped frozen with dry ice in a recyclable cake box.